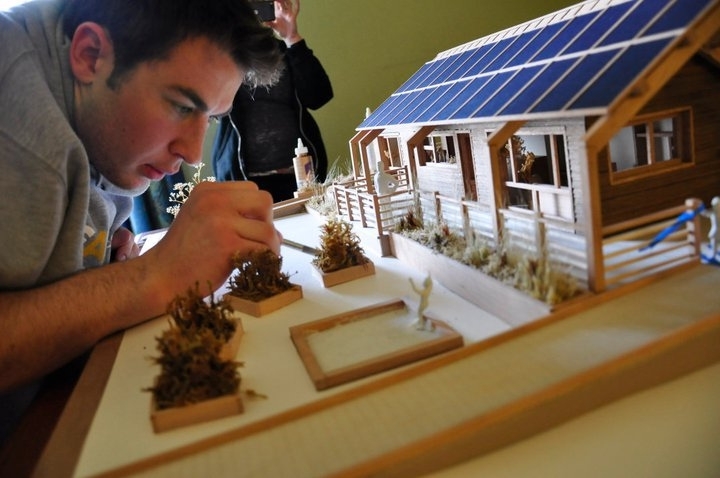 Team Massachusetts is bringing a unique perspective to the Solar Decathlon this fall. You might say it is a fourth dimension because of the team’s newly constructed 4D Home. But it could also be argued that it is because the Massachusetts College of Art and Design and University of Massachusetts Lowell are collaborating for the team’s first entry into the biennial competition, and they’re both public institutions. Team Massachusetts has created a compact, energy-efficient, sustainably designed house built for a family of three with two bedrooms, one bath, a kitchen, dining room, laundry/mechanical room, and living room. At 945 ft2, the savvy, highly efficient house is aimed at reinventing the idea of New England architecture. Meanwhile, Team Massachusetts is adding the fourth dimension of “time” to the interior of the house (and in name), taking into account the transitions a family and home go through over the years. By using moving walls for adaptable living spaces, rooms can be opened for family gatherings and the extra bedroom removed once the youth has gone off to college. Outside the 4D Home are deck and gardening areas, with a trellis on the south side supporting the 6.5-kW solar array just above. The trellis doubles as a shade for the house, mirroring the roof. Underneath six of the solar panels, hybrid solar water heaters absorb heat energy to use for the house’s hot water load in conjunction with the heat pump, which will work at night and on cloudy days. All the appliances—including the water heater and refrigerator—are ENERGY STAR-rated. Energy-efficient design elements—such as super-insulated walls and triple-pane windows—will help reduce heating and cooling costs, adding to the house’s affordability. Currently, the team is in the construction process and making preparations for its trip to Washington, D.C. Once the competition is complete, Team Massachusetts plans to sell the house to a local family at a discounted price. To follow Team Massachusetts’ progress on the 4D Home, visit its blog or official Facebook page or follow it on Twitter at @TeamMA_4Dhome. Erik Hyrkas is a correspondence writer for the Office of Energy Efficiency and Renewable Energy. 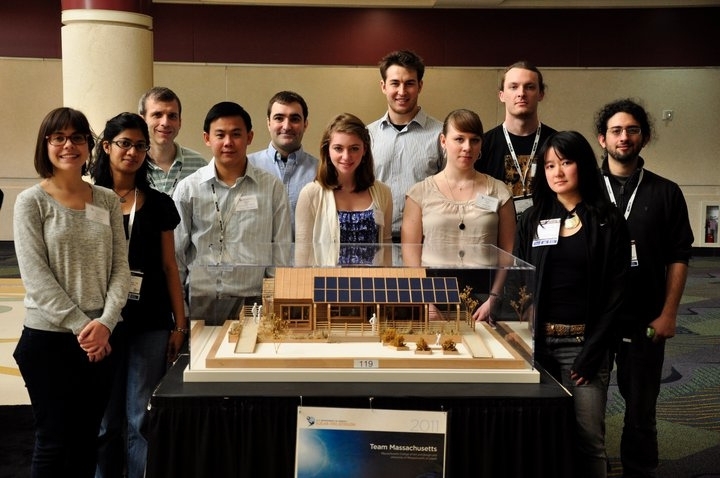 This entry was posted on Friday, July 15th, 2011 at 11:48 am and is filed under Solar Decathlon, Solar Decathlon 2011, Team Massachusetts, Teams.